Drought has been declared in the western Indian state of Maharashtra, despite an ambitious government scheme to replenish ground water supplies. So what went wrong? BBC Marathi investigates. "This year we received rains for only two days. But this is unlikely to last us for the next 15 days. The government will have to provide us water via tankers," says Nana Dudhare, the head of Akhatwada village in Khultabad district. Khultabad is among 151 administrative blocks in the state where drought was officially declared on 31 October last year. 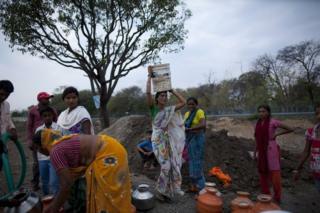 Water shortage is a familiar story in Maharashtra. In 2016 severe drought prompted the government to ask local municipalities to stop supplying water to swimming pools - in an unprecedented move, a train carrying half a million litres of drinking water was sent to the area of Latur. But this year was meant to be different. A ground water conservation scheme that cost the government millions of rupees was expected to yield results. The Jalyukta Shivar Abhiyan, as it is known, has been touted as the solution to Maharashtra's water problems. The scheme aims to take advantage of years with good rainfall - by storing and conserving the rain water it hopes to create perennial sources of water in every village. It specifies nine methods of conservation, including digging farm ponds, deepening small streams and constructing small dams. It has another ambitious goal too: make 5,000 villages free of water scarcity every year. It has been implemented in 16,522 villages across the state so far, including Akhatwada and the rains were reasonably better last year. Yet, the scheme does not seem to have had much of an impact given that many of these villages are already facing severe water shortage. The situation is only expected to worsen as the hot summer months approach. Is India's Bangalore doomed to be the next Cape Town? Much of the reason for this appears to be the programme itself. Villagers in Akhatwada, for instance, complain that they were not consulted about the best methods to conserve water under Jalyukta Shivar. "The government has its own set methods of doing the work, and we don't have a say. They decided which ponds and streams should be deepened and then abandoned most of them halfway. The machines were pulled out before the work was complete," says Somnath Kamte, a farmer who saw a pond dug in his property. He says that even the pond in his own farm is likely to run out of water in the coming days. Prof HM Desarda, an agricultural economist based in Maharashtra, has been one of the programme's biggest detractors. He filed a petition in the Bombay High Court in 2015 when the scheme was first announced, calling it "unscientific" and alleging that its implementation was faulty. He says that the programme's method of water conservation is "conceptually and operationally flawed" and "lacks a holistic approach". "In their anxiety to show that they have invented something out of the box, the government has gone ahead and implemented a programme with no basic understanding of the science of hydrology or even ecology," he told the BBC. He says that the proper way to carry out hydrology schemes was to examine the sources of water and adopt "macro approaches" to conserving it. By merely going to villages and digging ponds and deepening streams, he argues, you end up damaging fragile eco-systems and not solving the underlying problem. The Bombay High Court asked a panel to investigate Prof Desarda's objections, but he contested the findings, which upheld the "scientific" approach of the scheme, asking why the committee only visited nine villages when the programme had been implemented in more than 16,000. In February, the court refused to scrap the programme in what was seen as a major relief for the government. The state water resources minister, Vijay Shivtare, says his government stands by the scheme. "A water-audit is undertaken before we begin any work in any village. Information like the amount of water needed, how much water is available to the animals, how much water is there for irrigation, the capacity of the storage pond in the village, the level of deficiency - all this information is gathered and submitted to local authorities," he told the BBC. A state parliamentarian too says that the programme was a "top class scheme and no-one should criticise it". Mr Shivtare adds that it was unfair to call the programme a failure when the real issue was a lack of rain. He says that although there had been higher rainfall last year compared to previous years, it was still not enough for the programme to succeed. "The structure of Jalyukta Shivar was created on the assumption that a certain amount of rain will be received on average. If the rains do not come close to that, what do we do? The scheme never promised that water would come from the earth. It is meant to conserve the water falling from the sky," he told the BBC.